Welcome! Come participate in a transformational and rejuvenating retreat with Tracie Sage. Deepen or develop your own practice. Experience, honor and rejuvenate yourself. Connect with nature and the divine within all. Share your experience in a supportive group environment. 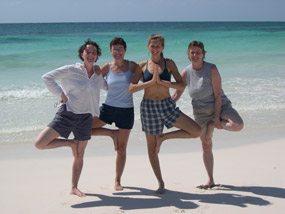 Eat delicious food, relax, breathe, swim, do yoga and enjoy the blessings of retreat. Give yourself (and all of us) a real treat. Experience the combination of Yoga, natural hot springs, a beautiful environment and a supportive and inspiring group of people. Deepen or develop your own practice. Experience, honor and rejuvenate yourself. Connect with your body, yourself, nature and each other. Eat delicious food, share music and conversation, swim, soak in hot springs, practice yoga, relax, breathe and enjoy the blessings of retreat. Too sweet to miss! Call 541-479-5128 for more information. "I loved this retreat! It was a perfect blend of yoga, meditation, free time and group interactions. Tracie is a very gifted teacher–totally present–and definitely in her element when she"s teaching! We all received a lot of personal instruction and tweaking of our poses during the classes. And to top it off the beauty of nature surrounding us was totally exquisite! Thank you Tracie for a very beautiful and satisfying, body, mind and soul retreat!!!" Bring blessings from your retreat into your life with a Package or Immersion or Love Coaching. For Tracie’s most up-to-date retreat schedule and locations, call 541-479-5128. Copyright 2013. All Rights Reserved. Wild Spirit Yoga.